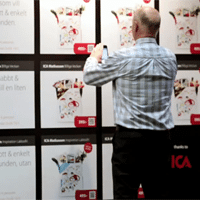 Swedish ecommerce platform provider Jetshop has provided NFC World with the preliminary results of a landmark project designed to find out how the ability for shoppers to use their mobile phone to make a purchase directly from a printed poster will affect traditional retailing. A new take on the conventional department store concept has been undergoing testing at Stockholm Central Station, with the aim of discovering how the new generation of mobile-connected “poster stores” will impact the future of retailing. Since Korea’s Home Plus introduced the poster store concept in June last year, the idea of using QR codes and NFC tags to let consumers make a purchase directly from a poster or out-of-home advertising board has received widespread interest. If the new posters allow shops to be moved to where the customers already are, the Swedish project team asked, what impact will that have on shoppers, shopping centres and property owners? How much space will the shop of the future actually need and what kind of products at what kind of price points will consumers be willing to buy in this way? To find out the answer, ecommerce platform provider Jetshop set up a 130 square metre concept superstore which featured twenty individual departments. Each department presented a selection of items available to purchase from one of Jetshop’s ecommerce platform customers, including a supermarket chain, a fashion retailer and a camping equipment specialist. An image of the product, its price and a QR code that could be used to purchase the item by reading the 2D barcode with a mobile phone was included for each promoted product. Posters were also wrapped around sixteen pedestals in the area leading from the main station concourse to the metro station, each of which featured an individual product. “The superstore is an initiative to help our merchants to better understand how to use the technique to drive sales, consumer dialogue and usage of square metres for retailing,” Christian Zanders, Jetshop’s CEO, explained to NFC World. Detailed feedback from the project as well as the results of a consumer survey which covered attitudes to the idea of pop-up shopping, mobile shopping and QR codes is currently being analysed and will be available in the next few weeks. “There was a sharp price barrier,” he explains. “Products priced over €150 (US$197) met very low interest. “The store that was most successful was a cosmetic store that also was well represented with ‘perfume guides’ in the superstore. The guides carried perfume belts with sampling of the perfumes exposed at the superstore. “Using people as guides in pop-up stores is probably a success factor,” Zanders says.